Named for a Roman deity, the Janus was an all-around weird car that was only built for just over a year before everyone realized that it wasn't any good. Seriously, what the hell were they thinking with this car? The design of the Zundapp Janus appeared to have been made by taking two BMW Isettas and sticking them together, but for some reason, facing opposite directions. Fans of microcars have been quick to defend the Janus, saying that it was actually quite an advanced design, and that it was one of the only microcars which could actually seat four adults comfortably. But half of it is still backwards. Just as the energy crisis in the Seventies had a massive influence on automotive trends for years to come, the 1956 Suez crisis had a similar impact on European car design. Specifically, it led to the rise of the "bubble car" an extra small variety of automobile which began with the Messerschmitt KR 175 and is now best remembered for such cars as the Isetta and the Peel P50. Must bubble cars would only have room in them for the driver and one passenger, although some would fit only the driver. 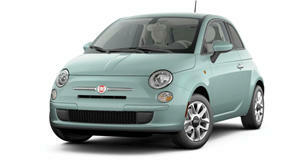 The nice ones would end up being killed off by much better and more practical small cars like the Mini and the Fiat 500. But there were also some attempts to make slightly bigger bubble cars. Of these, the Janus is without question the weirdest. Zundapp is a company which had been building motorcycles for about 40 years before it built its first car. But it had very nearly built one before. During the Thirties, Zundapp had worked with Dr. Ferdinand Porsche on some early prototypes of what would eventually become the Beetle. Three such prototypes were built of what was then known as the Type 12 were built, but all were destroyed during WWII. Zundapp decided to stick with motorcycles for a time after the war. However, the bubble car trend seemingly gave it a good opening to call on the small car knowledge gained from the Type 12 and also find a new use for its line of motorcycle engines. The Janus was named for the Roman deity for whom the month of January is named. Being in charge of time, Janus had two faces, one facing forward in time and one facing backward. The connection to the car is obvious, except here, instead of looking back in time, rear-facing passengers would be faced with the grilles of cars belonging to angry motorists trapped behind the absurdly slow bubble car. This slowness came from the fact that the engine was a 245cc (that&apos;s 15 cubic inches, just so you know) one-cylinder two-stroke engine that produced 14 horsepower. There was no shortage of other bubble cars with more power, and these were usually carrying half the number of passengers. Top speed was about 50mph, but would be even lower if the car was full. Passengers had the added adverse effect of changing the handling. Since the engine, which was mounted between the seats, was so small and light, a full passenger load would radically change the car&apos;s center of gravity, making it more likely to roll over in a sharp turn. It also basically goes without saying that, once in an accident, the Janus provided basically no safety measures whatsoever. The Janus lasted only from 1957 to 1958, but nearly 7,000 units were produced in that time, which is actually fairly impressive, all things considered. But durability was not one of Zundapp&apos;s chief concerns with the Janus, and fewer than 100 units are believed to exist today. Their incredible weirdness and rarity has made them valuable collector&apos;s items though, so the few remaining owners do at least have that. Safety regulations meant that there would never be another Janus, but even if these had never stepped in, the double-sided car was never really going to catch on anyway.